On the evening/morning of May 23/24, 2014, the possibility exists that a major meteor display may occur as seen from the North American longitudes of the northern hemisphere. On May 24, between the hours of 6:00 and 8:00 Universal Time, the Earth is expected to encounter numerous trails that were produced by comet P/209 LINEAR as it orbits the inner solar system. These trails were created as far back as 1798. The most recent trail expected to be encountered was produced in 1979. The center of the closest trail is expected to pass within 0.0002 AU (astronomical units) or roughly 18,500 miles from the Earth. This distance in more than 10 times closer than the mean distance from the Earth to the moon. Unfortunately this comet is a very small object and its dust production (as least recently) has been very low. Therefore a meteor storm is not expected, but rather a display on par with the major annual meteor showers for an unknown length of time is more likely. Major annual meteor showers normally produce near 60 meteors per hour as seen from dark rural locations. Although it is not known for certain, we can only hope that dust production was higher in the 18th and 19th centuries. Some good news is that particles shed by this comet are expected to be larger than normal, therefore producing bright meteors. More good news is that the time of maximum occurs favorably for North America, ranging from 23:30 PDT to 2:30 EDT. The moon will be waning crescent phase and will not be a factor as it rises just before dawn. These meteors will radiate from the northern portion of the constellation called Camelopardalis, approximately 10 degrees from Polaris (Alpha Ursae Minoris). This is a dim constellation that occupies a large portion of the high northern sky. From most areas of the northern hemisphere this constellation is circumpolar, meaning that it never sets below the horizon. As displayed on the illustration above, at the time of predicted maximum the expected radiant will have roughly the same altitude as the bright star Polaris, located only 10 degrees to the north. Therefore observers are urged to view northward at least between the hours of 6:00 and 8:00 UT on May 24th. This corresponds to 2-4am EDT and 11pm-1am PDT. The best locations to view this display will lie along the northern tier of states up to approximately 50 degrees north latitude. Locations further north will not be in total darkness as twilight will last all night long this time of year. Locations too far south (south of 30N) will see reduced activity due to the lower altitude of the radiant. One advantage for observers in the northern tropics is that many of these meteors may be “earthgrazers”, meteors that skim the upper atmosphere rather than penetrate lower into the more dense portions of the atmosphere. This creates meteors that are very long and sometimes last for several seconds rather than the normal sub-second duration. So while numbers may be lower as seen from the tropics, any activity seen from these regions may be more impressive. May nights are not known for high meteor activity as seen from the northern hemisphere. In fact it is one of the least active times of the year with only 2-3 meteors normally being visible each hour during the evening. Morning hours are better with the addition of members of the annual Eta Aquariid meteor shower. Morning hourly rates are normally near 8 in late May. 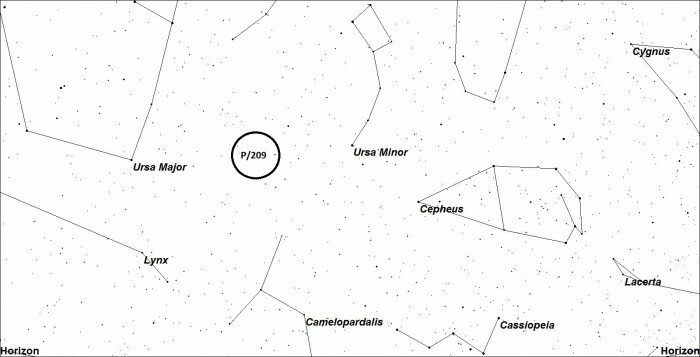 So any activity from comet P/209 should be fairly obvious. Unlike the well known Perseids of August, these meteors will strike the atmosphere at a medium velocity therefore persistent trains will be scarce. The average meteor from this display should last a bit longer (.5-1.0 sec.) on average compared to your average fast Perseid. This will help any observers who wish to try and photograph this display as the combination of bright and slower meteors should show up well on photographic exposures. These meteors may be seen in any portion of the sky but they will all trace back to the constellation of Camelopardalis. Other meteors not belonging to this display will have random directions and velocities. This display will only be visible from American longitudes as daylight will interfere from other areas. These meteors will be nearly invisible from the southern hemisphere as the radiant will lie on or below the northern horizon at the time of the predicted maximum activity. 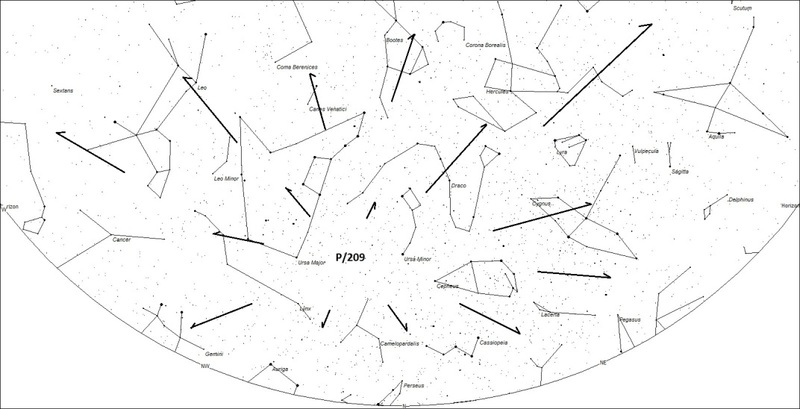 1 Quanzhi Yand Paul A. Wiegert (2013), Will Comet 209P/LINEAR Generate the Next Meteor Storm?